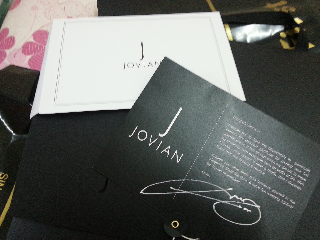 Girls, I forgot to mention in my earlier post that with every purchase of Jovian's ready to wear line, there will be a cute note from Jovian conveying his thanks to those who purchased any one from his line. tumpang tny..bli kat FL ne? why didn't i get the tq note? You didn't? The people at the counter would have slipped it in with your purchases. Takper...next round, insist on getting one.